Do you need further information? We would gladly send you an offer without obligation. Look at our map to find the fastes way to us. To avoid losing the orientation while driving, you can downloaf the map as a PDF file and print out here. Exit Siebenlehen (75) - Take the B101 towards Freiberg. In Freiberg the B 173 towards Chemnitz. Memmendorf follows after the village Oberschöna. Shortly after the entrance the restaurant "Goldener Stern" is located right next to the B173. Take the B 173 towards Freiberg. Memmendorf follows after the village Oberschöna. Shortly after the entrance the restaurant "Goldener Stern" is located right next to the B173. Exit Frankenberg (72) - Take the B 180 towards Flöha and then the B 173 towards Freiberg. Memmendorf follows after leaving Oederan. Shortly after the entrance the restaurant "Goldener Stern" is located right next to the B173. Take the B 173 towards Freiberg. Memmendorf follows after leaving Oederan. 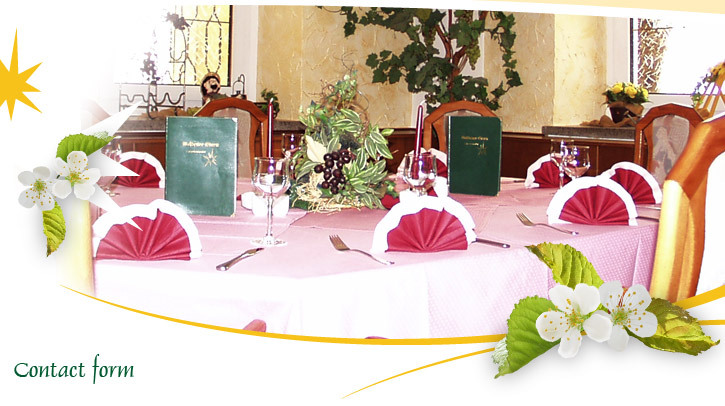 Shortly after the entrance the restaurant "Goldener Stern" is located right next to the B173.